LEXINGTON, Ohio - (August 3, 2013) – National Guard Panther Racing driver Oriol Servia missed advancing to the second round of Firestone Fast Six qualifications Saturday by just half of a tenth of a second, and will start 18th Sunday in the 90-lap Honda Indy 200 at the Mid-Ohio Sports Car Course. Servia admitted he’s never been so happy with the handling of his racecar while at the same time so disappointed with a qualification result, as the Panther crew was able to turn the tables on a sub-par practice day on Friday. Servia was eliminated from the first round of qualifications after posting a quick lap of 122.771 mph, 1:06.2839 seconds. The session was interrupted early with a red flag coming out for Luca Filippi, who got into the Turn 12 tires, which significantly cut down on the amount of time that Servia had to post his quick lap. 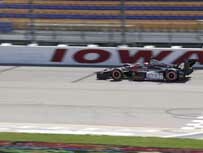 Once the track returned to green Servia was able to post just three timed laps and just narrowly missed advancing to the second round. Chevrolet drivers swept the front row for tomorrow’s race as Andretti Autosport driver Ryan Hunter-Reay took pole position and will be joined on the front row by Team Penske’s Will Power. Panther Racing hosted a large group of area Girl Scouts on Saturday thanks to the Ohio National Guard and Adjutant General Deborah Ashenhurst. 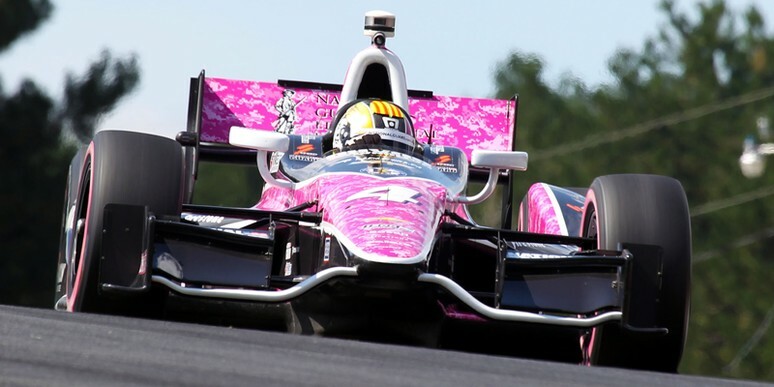 The team is honoring female National Guard soldiers this weekend with its “Pink Camo” IndyCar design in part because MG Ashenhurst is the only female adjutant general in the United States. The team conducted a short program with the Girl Scouts in its hospitality unit and then guided them on a tour of both the NBC Sports Network TV compound and through the garage area, including a visit to Firestone Racing, who has joined the team’s effort this weekend by creating a special pink sidewall Firehawk tire for the weekend. The visit concluded with the Girl Scouts receiving a specialty-made patch in the IndyCar Fan Village from the team’s popular mascot Clutch the Cat.